(does not fit tri-plate Enamel). 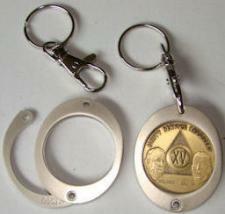 Cool oval metallic medallion holder, which is perfect for displaying your various years of sobriety. This medallion holder securely holds gold plate, silver/gold bi plate as well as bronze medallions in a very fashionable way with a clear view of the front and back of the medallion for awesome visibility. Detachable clip holds on to any belt loop or purse strap.